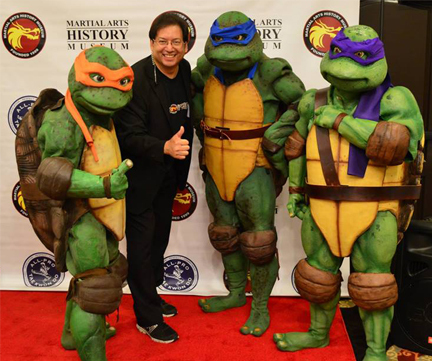 BURBANK, CA – Some of the greatest martial arts icons, pioneers, champions and movie celebrities gave of their time to raise funds and support the Martial Arts History Museum this last weekend at the Dragonfest Convention in Burbank, CA. Amongst some of the most recognized artists in the martial arts genre included Enter the Dragon John Saxon, James Hong who plays Mr. Ping in Kung Fu Panda, Michael Jai White, Cynthia Rothrock “Queen of the Martial Arts,” award-winning film director Art Camacho, kickboxing legend Benny “the Jet” Urquidez, television celebrity Donnie Williams, Tak Kubota, comedian Master Ken, Geddie Watanabe, Rodney Kageyama, T.J. Storm and many more. “The Martial Arts History Museum is a cultural facility that will keep history alive and to have been surrounded by such notables as Bill Ryusaki, Eric Lee, Doug Wong, Carrie Ogawa-Wong, Carl Totton, Leo Fong, Peter Cunningham is just amazing,” notes Art Camacho. The Dragonfest convention, resurrected by the Museum after a 10-year hiatus, brought in over 1,500 visitors to the Burbank Holiday Inn Media Center. In fact, every room was sold out because of the event. The Dragonfest Convention was lined with a multitude of vendor’s booths, which included martial arts jewelry, fun toys for the kids, martial arts weapons, t-shirts and a row of independent filmmakers. The convention also featured a number of special effects and prop makers including such notables as Steve Wang, John Goodwin, Hiroshi Katagiri and Koji Ohmura. Nick Palma’s life-sized ninja turtles posed for pictures throughout the day. In fact, the players in the turtle outfits were the actual performers in the ninja turtles movies. The next Dragonfest Convention will be held on May 16 and May 17 at the Burbank Holiday Inn in 2015. The Martial Arts History Museum is a non-profit 501(c)(3) organization and its goal is to bring awareness of how Asian history became part of American history through the martial arts. For information on the museum, visit www.MAmuseum.com or call (818) 478-1722.